Not to be confused with Steven Spielberg’s developing Lincoln project, Bekmambetov’s genre splice re-imagines our 16th president as a vampire slayer stomping through the Civil War-era United States. In the photo abaove, Ben Walker (as Lincoln) administers a painful beating to what we assume is an undead soldier. Can you think of anything cooler than Honest Abe laying the smack-eth down on a bloodsucker? 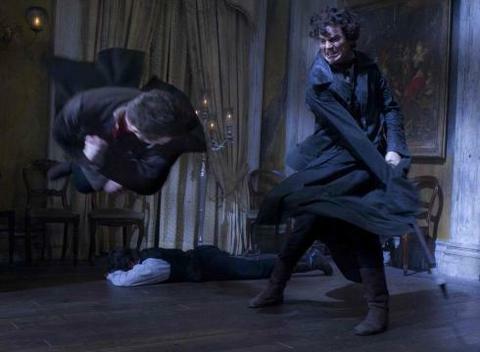 It’s hard to tell from the angles of this picture, though, just how stylish the action in Vampire Hunter will get. Obviously, Bekmambetov helmed the over-the-top actioner Wanted with Angelina Jolie, as well as the visually revved-up Night Watch (and its crazy sequel). From the look of the above shot, Lincoln’s foe is taking a spin in mid-air. But is it slow-motion? Wachowski-inspired bullet-time? Straight-up, Brad Bird-style, balls-to-the-wall action? We should be seeing a trailer on Vampire Hunter soon, as the film is racing ahead to a June 22 release date. Until then, it’s all speculation on the motif Bekmambetov chooses to assign to one of our nation’s most iconic historical figures. Then again, when it comes to Abraham Lincoln: Vampire Hunter, historical accuracy likely won’t be much of an issue.